The Fulbright Foreign Language Teaching Assistant Program aims to increase Americans’ knowledge of other cultures and languages by supporting teaching assistantships in over 30 languages at hundreds of colleges and universities. Prior to arriving at SIUE, Balloumi worked as an English teacher and assisted non-governmental organizations focused on entrepreneurship, women empowerment, countering violent extremism and fighting corruption in Tunisia. Aside from teaching undergraduate Arabic courses, Balloumi has fully embraced SIUE’s campus life, having recently attended Arts & Issues events like Fred Gray’s Montgomery Bus Boycott presentation. He was also invited to speak on Tunisia and the influence of French colonization for another professor. Balloumi has also become extremely active in a number of student organizations, including the Global Ambassador Program, Public Relations Student Society of America, which he was elected the organization’s treasurer, Service Saturdays, as well as the International Hospitality Program. “I find the International Hospitality Program particularly unique because it helps to integrate international students into the community by fostering relationships between students and American families, which I consider very welcoming,” Balloumi said. “As a Fulbright scholar, I’m expected not only to teach and take courses, but also to serve as a cultural ambassador of my country. Due to his extensive campus involvement, Balloumi was chosen as a model scholar at the Fulbright Foreign Language Teaching Assistant Mid-Year Conference in December 2018 in Washington, D.C. He and other Fulbright scholars met with Assistant Secretary of State for Education and Cultural Affairs Marie Royce. During her conference address, she particularly applauded Balloumi for his “amazing time management skills” to be able to balance teaching and his on-campus activities. Balloumi will conclude his visit at SIUE in May 2019. 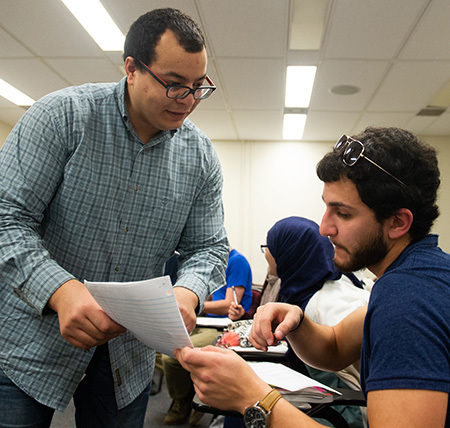 Photos: SIUE Visiting Fulbright Scholar Wajdi Balloumi, of Tunisia, works with an SIUE student. 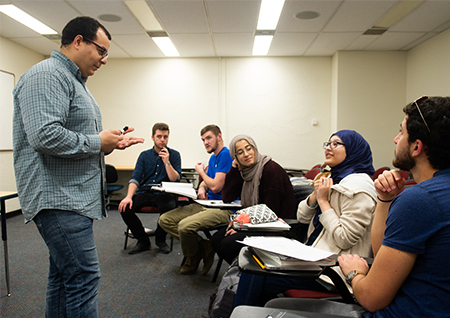 SIUE Visiting Fulbright Scholar Wajdi Balloumi, of Tunisia, teaches a course on Arabic.